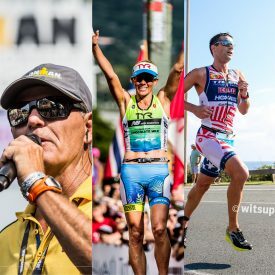 TAMPA, Fla. (May 8, 2017) – The IRONMAN Foundation® today announced that the 2017 IMF Ambassador Team comprising 19 age-group triathletes from around the United States will be led by Team Captain and “Voice of IRONMAN” Mike Reilly as well as by pro triathletes Mirinda Carfrae, a three-time IRONMAN World Champion, and Timothy O’Donnell, a multi-year IRONMAN® World Championship top ten finisher. To support The Foundation’s mission to create tangible impact in IRONMAN race communities through philanthropy and volunteerism, the ambassadors will focus their efforts on The Foundation’s eight service projects in North America. Each service project is conducted in partnership with a local nonprofit organization, powerfully linking IRONMAN athletes and TriClubs to the local race community. At the 2017 IRONMAN® 70.3® Oceanside triathlon, an adaptive surf clinic for children with physical challenges was held with the Challenged Athletes Foundation. At the 2017 IRONMAN North American Championship Texas triathlon, a local disabled senior received a new roof and volunteers helped restore the exterior of her home with Rebuilding Together Houston. Additional service projects include flood restoration with the U.S. Army Corps of Engineers and Friends of Lake Sonoma at IRONMAN 70.3 Santa Rosa, an adaptive climbing clinic and trail maintenance with Paradox Sports at IRONMAN Boulder, a race week hands-only CPR training with the American Red Cross at IRONMAN Lake Placid, and a day of service with the Salt River Children’s Foundation at IRONMAN Arizona. Two additional projects are planned for the 2017 IRONMAN World Championship and IRONMAN 70.3 World Championship events. For more information on each service project and how you can get involved, please visit http://bit.ly/IMFSERVICE. A Wanda Sports Holdings company, IRONMAN operates a global portfolio of events that includes the IRONMAN® Triathlon Series, the IRONMAN® 70.3® Triathlon Series, 5150™ Triathlon Series, Iron Girl®, IRONKIDS®, six of nine International Triathlon Union World Triathlon Series races, road cycling events including the UCI Velothon Majors Series, mountain bike races, premier marathons and other multisport races. IRONMAN’s events, together with all other Wanda Sports Holdings events, provide more than 680,000 participants annually the benefits of endurance sports through the company’s vast offerings. The iconic IRONMAN® Series of events is the largest participation sports platform in the world. Since the inception of the IRONMAN® brand in 1978, athletes have proven that ANYTHING IS POSSIBLE® by crossing finish lines at the world’s most challenging endurance races. Beginning as a single race, IRONMAN has grown to become a global sensation with more than 260 events across 44 countries. For more information, visit www.ironman.com. Wanda Sports Holdings is the world’s leading sports business entity, founded to capture the opportunities in the global sports industry and to contribute to the prosperous international sports landscape – in three key areas: 1) Spectator Sports (media & marketing business), 2) Participation Sports (active lifestyle business), 3) Services (digital, production and service business). Wanda Sports Holding incorporates the international sports marketing company Infront Sports & Media, the iconic endurance brand IRONMAN, and Wanda Sports China. The headquarters are in Guangzhou, China.